Current features of the course of postpartum purulent-inflammatory diseases, rise of erased and atypical forms require investigation of new ways of early diagnosis and further prognosis of the course of aforementioned diseases. Aim: To identify the main factors that enables the prognosis of the course of postpartum purulentinflammatory diseases. Material and methods: The main group 170 women with postpartum purulent-inflammatory diseases, control group-40 women with an uncomplicated course of the postpartum period. We analysed 42 parameters such as the unique features of case history, the course of pregnancy, parturition, the data from clinical, laboratory and instrumental examination, including the results derived from the use of fluorescent spectroscopy (FS) in blood serum (BS) analysis. Results: Based on a thorough analysis and statistical processing of the results of investigation, the core predictive factors of the development of postpartum purulent-inflammatory diseases were established. It was found out that the common features across the main group of patients are extragenital pathology, gynecological conditions based on case history, a risk of miscarriage, complications during pregnancy, colpitis, TORCH-infections, duration of parturition for over 12 hours, presence of parturition anomalies and foetal distress. Additionally, concerning the main patient’s cohort, a number of significant risk factors influencing emergence of postpartum endometritis were identified. These factors are: the presence of acute respiratory illnesses, a risk of miscarriage, including a number of surgical interventions, and genital tearing during parturition. Based on the results of blood serum (BS) investigation using fluorescent spectroscopy (FS) it was established that the main parameters used for prognosis of postpartum purulentinflammatory diseases are a decline in fluorescent intensity and a presence of long-wave shift. Conclusion: Fluorescent spectroscopy allows establishment of a valid prognosis of the course of postpartum purulent-inflammatory diseases, which ensures a full recovery of the patients and prevents formation of maternal sepsis. Postpartum purulent-inflammatory diseases, Method of fluorescent spectroscopy (FS), Prognostic factors. According to the WHO-World Health Organisation (2018), more than 30 million people are annually affected by sepsis, with 6 million of them developing lethal cases correspondingly. This problem occurs mostly across low and middle income countries. Almost 3 million neonates and 1.2 million children are annually affected by sepsis. Out of 10 death cases during neonatal sepsis, 3 of them are caused by pathogens, resistant to antibiotics. Every 10th death during pregnancy and parturition results from maternal sepsis, with 95% of them occurring among low and middle income countries. More than one million of neonates annually die because of maternal infections, such as maternal sepsis . In spite of having an inconsistent maternal death rate, sepsis remains Ukraine’s most common death cause. It develops upon presence of complicated postpartum purulent-inflammatory diseases (PPPID). Early infectious complications such as ovaritis, salpingo-ovaritis, pelvic peritonitis, and sepsis appear as a result of dissemination of infectious agent. Female infertility, menstrual cycle distortion, and chronic pelvic pain are highlighted as the late infectious complications. The problem of PPPID is a relevant issue which remains unsolved. This issue requires an introduction of a new approach in order to find it’s solution. A typical diseases, which are commonly spread across population in the last few years reduced alertness of healthcare specialists concerning the course of such illnesses. However, the chance of any progression or complications in the case of such conditions remain open. The majority of the foreign literature of the past years includes recommendations concerning precautionary steps to stop development of septic conditions and optimise the antibiotic dosage and injection timing. This way, the major focus is to prevent the formation of complications, although there is an insufficient consideration towards diagnostics during emergence of PPPID in the organism of the postpartum women including evaluation of the prognosis of their course. Therefore an improvement of the diagnostic approach will be economically reasonable and would have allowed timely diagnostics and correct prognosis of the course of PPPID. It would be possible to achieve a better effect in terms of patient recovery with a benefit of reduced costs. There are numerous benefits in developing such an approach in terms of both treatment and care of every single case of the disease aforementioned. Fluorescent spectroscopy was used for diagnosis and control of the effectiveness of treatment chosen, which was successfully used earlier for the diagnostics of purulent-inflammatory complications and sepsis in surgical [2-5] practice, for the diagnostics of endogenic intoxication in the case of scald and in obstetric and gynecological [6-9] practice. To evaluate the efficiency of fluorescent spectroscopy for diagnostics and to control treatment efficacy of postpartum purulent-inflammatory diseases and to determine the core prognostic factors of their development. Upon carrying out research into aforementioned topic, alongside a standard scheme aiding improved diagnostics of postpartum endometritis, we also used FS. The clinical research centre for this particular investigation was the department of gynecology of Vinnytsia city clinical hospital. The luminescent laboratory of the department of experimental physics, Ivan Franko Lviv National University was an experimental research centre. The overall research was carried out from 2014 to 2017 . The participants cohort consisted of 170 postpartum women with postpartum endometritis (PPE). The patients were diagnosed through a thorough histological examination of endometritis, which discovered inflammatory lymphatic leukocyte infiltration after 9th day of postpartum period. The samples used in research were supplied from a manual vacuum-aspiration of the uterine cavity of postpartum women. Patients were divided into three groups: First-75 postpartum women with PPE, Second-65 postpartum women with PPE and lochiometria or haematometra, Residua post partum, Third-30 postpartum women with PPE and lactostasis. Women with single pregnancy, who had histologically confirmed diagnosis of PPE in postpartum period were involved in the research. These women were informed beforehand and gave an informed consent for participation in the aforementioned study. Postpartum period after multiple pregnancies, period after antenatal death of the fetus, decompensated somatic illnesses, presence of primary immunodeficiency among postpartum women, presence of HIV infection, tuberculosis (pulmonary and extra-pulmonary), diabetes and a presence of oncological pathology were all considered as exclusion criteria. The control group included 40 women with uncomplicated flow of the postpartum period. As depicted in Table 1, the majority of women of both main and control group were aged 25-34-years-old, which are 51.8% and 50.0% correspondingly. Additionally, when comparing main and control groups, 96.5% and 95.0% lived in the cities and 61.7% and 72.5% had first time pregnancy accordingly . Table 1: Patient similarity analysis: Control group and main group (n=210). Uncomplicated emergency childbirth in cases analysed were common among 31.8% of patients of main group and 30.0% of patients of control group. The proportion of women with a complex obstetric case among main and control groups was found to be very similar, with 19.4% and 20.0% correspondingly. The majority of women of main and control groups became sexually active at the age of 18-23-years-old, which is 56.5% and 62.5% accordingly. Furthermore, a great number of women had their first menstruation at the age of 13-15-years-old, prevailing among 90.0% of main group and 95.0% of control group respectively. When comparing two groups, proportion of women with anaemia among main group and control group had almost identical indicators, with 57.1% and 57.7% respectively. Most women of both groups had normal parturition and vaginal childbirth, with 91.2% and 97,5% correspondingly, and a mean birth weight remained between 2.6 kg and 3.9 kg, which was 85.9% and 85.0% proportionately. Consequently, the characteristics of the patients of both main and control groups according to these 11 categories are similar (homogenous). This allowed us to carry out the research described in this paper. The methods used in the study are as follows: clinicallyanamnestic, laboratory, biochemical, instrumental (sonographic examination of a uterus and ovaries, bacteriological and histological examination of metroaspirate, fluorescent spectroscopy) and mathematically-statistical processing. The study of spectro-fluorescent characteristics of the blood serum (BS) using fluorescent spectroscopy (FS) were completed with application of MDR-2 and MDR-12 monochromators. The light with a wavelength of 280 nm was implied in the stimulation of BS. This wavelength corresponds to human’s albumin region of luminosity. Albumin molecules demonstrate altered physicochemical properties among patients with postpartum purulent-inflammatory diseases. Such properties can be explained by an influence of the products of endogenous intoxication . A thorough study of 42 main parameters was carried out. Such parameters include: the age of the patient, place of residence, number of parturitions throughout case history, hospital referral, case history in terms of gynecology and obstetrics, number of abortions throughout case history, start of sexual activity age, menstruation cycle start age and its regularity and whether there was any general or gynecological surgery done so far. Additionally, in-depth dissection of the course of pregnancy was carried out, including such factors as risks associated with its interruption, release of blood exudate, acute respiratory diseases, emergence of extragenital pathology, TORCHinfections, gestosis of early and late pregnancy, polyhydramnios and foetal distress. Moreover, the results of laboratory tests of samples of blood and urine were analysed for the presence of anaemia, leucocytosis, leukopenia, proteinuria of the urine, including data from ultrasound diagnostics and analysis for the presence of colpitis and bacterial vaginosis. A detailed investigation into the stages of parturition was performed, putting emphasis on factors such as the way of delivery, the duration of delivery, duration of oligohydramnios, presence of anomalies, perineal laceration during delivery and the mass of the foetus. Furthermore, the data of body temperatures and description of surgical intervention were obtained from patients who had undergone treatment during postpartum period and were analysed as well. Among 170 cases, manual vacuum aspiration was performed on 132 patients (77.7%). After bacteriological examination was performed, the patients from the main cohort demonstrated a verified spectre of microbial variability, demonstrated on the Figure 1. Figure 1: The spectre of excitatory factors, gained from the uterus cavity via application of manual vacuum aspiration to postpartum women with PPE. Among infectious agents gained from uterus cavity of aforementioned patients, 28.7% of them had Escherichia coli (E. coli), 21.3%-Enterococcus faecalis (E. faecalis), 13.9%-Staphylococcus aureus (S. aureus), 10.2%-Staphylococcus epidermidis (S. epidermidis), 7.4%-Staphylococcus haemolyticus (S. haemolyticus). The presence of other agents was insignificant for the overall proportion. All patients of the experimental group were thoroughly and effectively treated. Aspirate collected from manual vacuum aspiration was used for both gynecological and bacteriologic research. Among different medication, a variety of broad spectrum antibiotics such as cephalosporins, fluorquinolones and metragils such as Meritine were used in treating patients. Furthermore, in severe cases, two types of antibiotics were used for treatment. Moreover, the patients were also administered anti-inflammatory treatment, antipyretic therapy, uterotonics and probiotics. Upon completion of treatment, all patients left the hospital with no abnormalities to their well-being recorded. During treatment blood serum samples collected from patients involved were analysed using fluorescent spectroscopy in order to evaluate its effectiveness. If any deterioration of the blood serum fluorescent indicators took place, the treatment was revised. This research allowed formation of new ideas concerning pathogenetic postpartum purulent-inflammatory diseases, which will get a broader explanation in our next publications. We carried out a detailed analysis of the factors demonstrating a significant prognostic value in terms of PPE development within the research study. Such factors were identified as an extragenital pathology [odds ratio (OR)-11.03, 95% confidence interval (CI) (4.11-29.58), ?<0.0001], gynecological diseases [OR 10.13, 95% CI (4.02-25.48), ?<0.0001], a risk of miscarriage [OR 5.85, 95% CI (1.35-25.31), ?=0.02], complications during pregnancy [OR 5.27, 95% CI (2.54-10.96), ?<0.0001], colpitis [OR 110.20, 95% CI (24.99-486.06), ?<0.0001], TORCH-infections [OR 40.05, 95% CI (5.2-306.79), ?=0.0004], parturition for over 12 hours [OR 7.05, 95% CI (1.63-30.40), ?=0.009], a presence of parturition anomalies [OR 10.37, 95% CI (2.42- 44.46), ?=0.002], foetal distress [OR 10.48, 95% CI (1.39- 78.89), ?=0.02]. Besides, when comparing the main group with a control group, not only there were less women older than 35 years, but also the majority of the patients stayed in hospital from 3 to 5 days. Diagrammatic demonstration of the independent prognostic factors of PPE development is depicted in Figures 2-4. Figure 2: Independent prognostic factors of PPE development (Colpitis). Figure 3: Independent prognostic factors of PPE development (Proteinuria). Figure 4: Independent prognostic factors of PPE development (Complications during pregnancy). Surgical treatment (Figure 5) was performed in 78.8% cases-134 postpartum women from the main group [OR 8.68, 95% CI (4.02-18.76), ?<0.0001], while the same indicator among control group was 30.0%, which is 12 women. Apart from being a significant prognostic value for the main group, this feature remained important for other two subgroups-postpartum women with PPE and PPE+lochiometria. A number of women who have undergone surgery in the first subgroup was 66 (88.0%) [OR 17.11, 95% CI (6.48-45.17), ?<0.0001] compared to 57 women (87.7%) in the second subgroup [OR 16.62, 95% CI (6.1-45.30), ?<0.0001]. 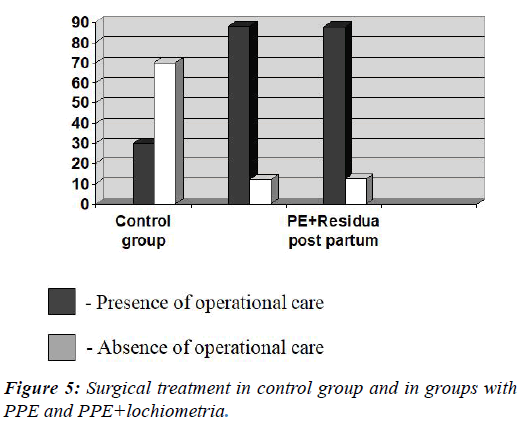 Figure 5: Surgical treatment in control group and in groups with PPE and PPE+lochiometria. The chance of a woman having both a risk of miscarriage and acute respiratory disease (ARD) (Figure 6) was common among 82 patients (48.2%) [OR 3.21, 95% CI (1.44-7.15), ?=0.004] and was a statistically correct confirmation of the emergence of PPE for both the main group and the subgroups of patients with PPE-43 patients (57.3%) (57.3%) [OR 4.63, 95% CI (1.93- 11.07), ?=0.0006] and with PPE and lactostasis-14 patients (46.7%) [OR 3.01, 95% OR (1.07-8.46), ?=0.04]. 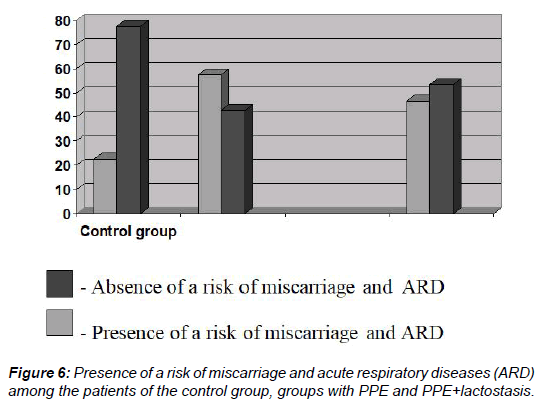 Figure 6: Presence of a risk of miscarriage and acute respiratory diseases (ARD) among the patients of the control group, groups with PPE and PPE+lactostasis. Demonstrated in Figure 7, the main group of patients-63 women (37.1%), suffered from perineal laceration during delivery, while in control group this number was much lower-8 women (20.0%). This feature was a significant prognostic value concerning formation of PPE for the PPE+lochiometria/haematometra-29 women (44.6%) [OR 3.22, 95% CI (1.29-8.05), ?=0.01] and for the main group in general-63 women (37.1%) [OR 2.35, 95% ? (1.02-5.43), ?=0.04]. 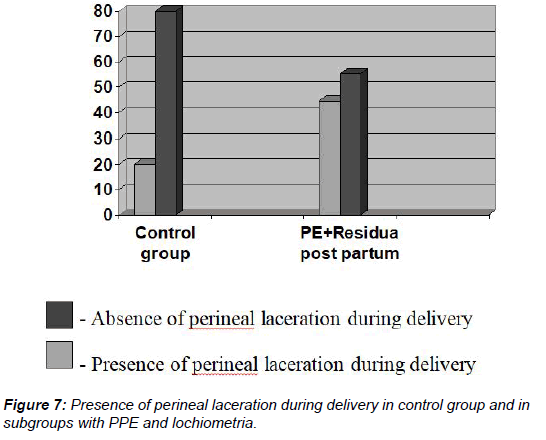 Figure 7: Presence of perineal laceration during delivery in control group and in subgroups with PPE and lochiometria. Invasive interventions during parturition (Figure 8) were done in 93 cases (54.7%) of postpartum women of the main group [OR 3.18, 95% CI (1.49-6.79), ?=0.003] and in 11 cases (27.5%) of postpartum women of control group. 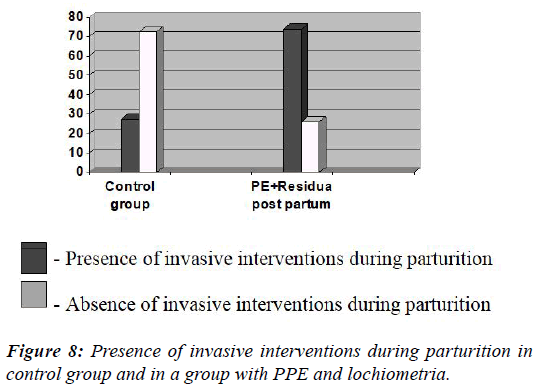 Figure 8: Presence of invasive interventions during parturition in control group and in a group with PPE and lochiometria. This factor was a significant prognostic value of the emergence of PPE for all women of the main group and subgroups with PPE, lochiometria and haematometra-48 patients (73.8%) [OR 7.44, 95% CI (3.06-18.08), ?<0.0001]. Apart from using a standardised algorithm for examining patients with PPE, the researchers also carried out a study of the BS using FS. The main parameters considered were a fluorescence intensity (If) and an assembly of the maximum values of fluorescent layers (lmax). In general, a decline in fluorescence intensity among the main group of patients was observed in 156 cases (91.7%) [OR 78.0, 95% CI (26.36-230.82), ?<0,0001], while in a control group this indicator appeared only in 5 cases (12.5%) correspondingly. As a consequence, this feature was a significant statistical value for both the main group and all the subgroups in the study (Figure 9). 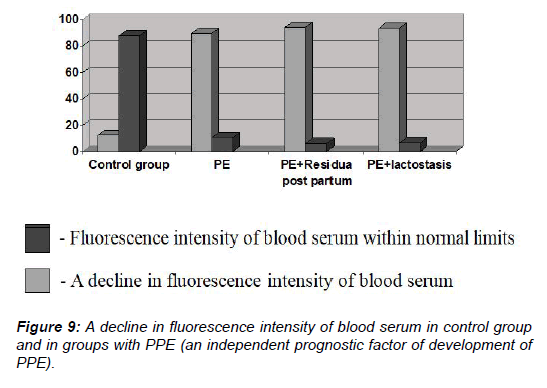 Figure 9: A decline in fluorescence intensity of blood serum in control group and in groups with PPE (an independent prognostic factor of development of PPE). The presence of a long-wave shift of BS fluorescence spectra was observed in 76 cases (44.7%) [OR 31.53, 95% CI (4.23- 234.83), ?=0.001] of the main group and only in 1 case (2.5%) of the control group. An indication of the long-wave shift of BS fluorescence spectra was a statistically significant in terms of PPE emergence for both the main group and all three subgroups (Figure 10). The results indicate that spectral fluorescent signatures (SFS) of BS are accurate indicators for diagnostics of purulent-inflammatory diseases and can be applied in obstetrics and gynecology practice. Dissection of these characteristics in dynamics allow timely diagnosis, effective patient monitoring and assists in preventing sepsis in obstetrics [6,10,11]. 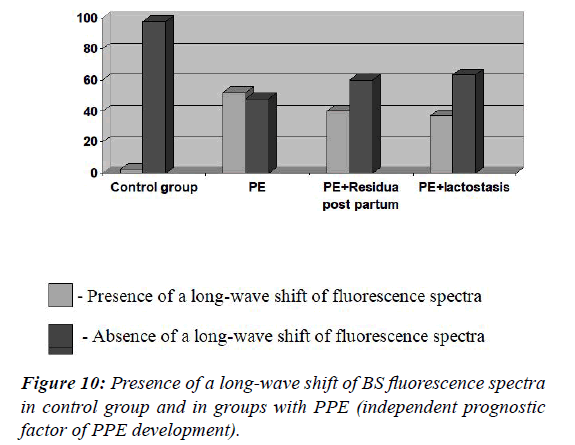 Figure 10: Presence of a long-wave shift of BS fluorescence spectra in control group and in groups with PPE (independent prognostic factor of PPE development). As a matter of fact, the results of the study allowed identification of the core prognostic factors of PPE development. Upon laboratory and instrumental examination, a number of factors indicating development of PPE were identified as colpitis, proteinuria, TORCH-infections and results of fluorescent spectroscopy analysis of BS (a decline in fluorescent intensity and a presence of long-wave shift). Leucocytosis and increased body temperature were not significant prognostic factors of PPE development. This is a confirmation that nowadays, due to an elevation of rare and atypical forms of PPE there is a need for development of new investigation techniques, such as fluorescent spectroscopy. During our research this method showed an high efficiency in terms of early diagnostics and treatment strategy monitoring. Fluorescent spectroscopy has a great pathogenetic implication in terms of diagnostics and enables a potential development of a pathogenetic treatment which will be described in more detail in our next publications. Identification of significant prognostic factors of PPE development was the main aim of this study. Therefore, according to the results of aforementioned research these factors are: a presence of extragenital pathology, gynecological diseases in case history, risk of miscarriage, complicated course of pregnancy, colpitis, TORCH-infections, duration of delivery for more than 12 hours, presence of parturition anomaly and foetal distress. Surgical interventions, risk miscarriage, acute respiratory diseases and both perineal laceration and surgical intervention during delivery are additional prognostic factors for separate subgroups. Our proposal for the use of fluorescent spectroscopy resulted in reliable and valid parameters, necessary for prognosis of postpartum endometritis. Therefore it is confirmed that the parameters pointing at severe form of the disease are a decline in fluorescent intensity of blood serum and a long-wave shift of blood serum fluorescence spectra. Acosta CD, Kurinczuk JJ, Lucas DN, et al. Severe maternal sepsis in the UK 2011-2012: A national case-control study. PLoS Med 2014;11:e1001672. Bulavenko O, Ostapiuk L, Rud V, et al. Approbation of the method of fluorescent spectroscopy for the diagnostics of the purulent-septic complications after the labor. Vinnytsia: National Pirogov Memorial Medical University 2015;19:161-7. Bulavenko O, Ostapiuk L, Rud V, et al. Diagnosis of postpartum purulent-septic complications by fluorescent spectroscopy, Zdorov?e zhenshchyni (Women?s health) 2015;4:63-5. Bulavenko O, Ostapiuk L, Rud V, et al. Justification of the feasibility of using the fluorescence spectroscopy method in the complex diagnosis of postpartum endometritis, Zdorove zhenshchyni (Women?s health) 2016;3:71-5. Herych I, Bulavenko O, Ostapiuk L. Spectral-fluorescent properties of serum as a reliable marker for ealy diagnosis of sepsis. J Gynecol Obstetr. 2014;2:71-4. Herych I, Bulavenko O, Ostapiuk L, et al. Fluorescent Spectroscopy: ability to use in medical practice. Liha-Pres 2015;366. Herych I, Ostapiuk L, Vashchuk V. Prospects for the diagnosis of sepsis and purulent-septic complications: the method of fluorescence spectroscopy. Visnyk Ukrainskoi medychnoi stomatolohichnoi akademii (The journal of the dental medical academy). 2009;9:248-56. Herych I, Ostapiuk L, Vashchuk V. Spectral-luminescent markers of verification, severity and prognosis of acute inflammatory abdominal pathology. Halytskyi likarskyi visnyk (Halytskyi medical herald) 2012; 19:25-7. Improvement of early diagnostics of purulent-septic complications. Text sourced form a medical brochure. National Pirogov Memorial Medical University, Vinnytsia 2014;4. ?stapiuk L. Diahnostyka ta prohnozuvannia rozvytku pisliapolohovoho endometrytu (eksperymentalno-klinichne doslidzhennia): [Diagnosis and prediction of postpartum endometritis (experimental and clinical study)] 2017. Savchyn V, Ostapiuk L, Voloshynovskyi A, et al. Application of the method of fluorescent spectroscopy in the diagnosis of endogenous intoxication with burn injury. Klinichna khirurhiia (Clinical Surgery). 2016;6:68-70.